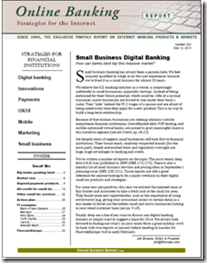 Seven years ago we published our first full report on mobile banking. 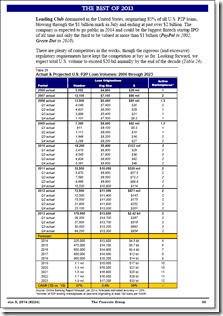 At that point, you could see that it would be widely used to access current balances and transactions. However, the broader services powered by the camera (remote deposit); GPS (location-aware alerts); and the audio jack (Square) were practically unimaginable back then. But now it doesn’t take much of an imagination to see that banking is best done on a smartphone. The screen size is perfect for managing the small amount of data needed to understand your current financial position. And the always-on, always-with-you device is ideal for handling issues that just can’t wait until you are home in front of your desktop computer. So let’s no longer think of mobile as a support channel. It’s the other way around. Branches, call centers, and even online banking will support mobile banking, which is destined to be the dominant form of money management for the next 20 to 30 years. 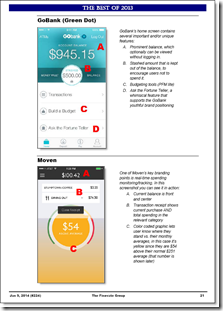 Last month, we looked at a key missing ingredient in mobile banking, the new account application. 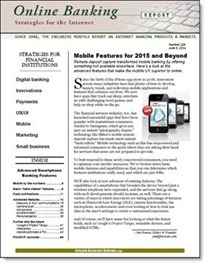 This month, we look at the advanced capabilities banks must support to make the mobile UX superior to online. One of the biggest debates in banking today is the role of the branch, and especially its significance in new account opening. Many analysts, this firm included, see remote account opening as a better experience for the customer and potentially much cheaper for banks (though it requires downsizing branch networks to achieve meaningful cost savings). But so far, most of the debate has been around the pros and cons of online/desktop account opening vs. the human-guided experience in branch. What’s missing in this discussion is the key role that MOBILE account opening will play going forward. With superior technology (think OCR via smartphone camera, instant funding by taking a picture of your debit card, and real-time access to new deposits) mobile opening is much more compelling than desktop alternatives. And the technology is here today, from the likes of Mitek, Jumio and others. Now, it takes hard work to execute via mobile channels. 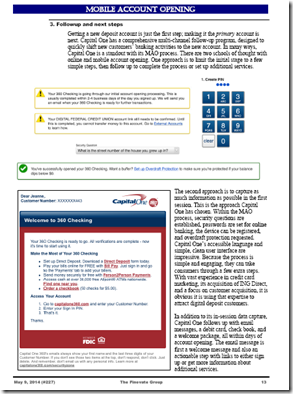 This report will help you get started. 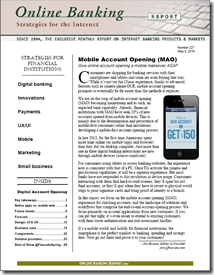 What do financial institutions need to keep in mind when it comes to mobile security? Our latest report Mobile Banking Security examines how banks and other financial institutions can balance safety and convenience in pursuit of a seamless and secure mobile experience for their consumers and clients. 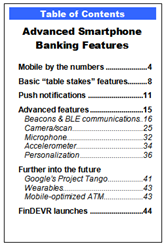 We list fifteen different themes that will dominate the conversation on mobile banking security in 2014. From authentication to premium products for niche markets, we look at the innovations and the actual deployments that are providing safer networks for e-commerce and financial transactions for the increasingly “mobile-only” user. Will the “wild west” that is the Android app ecosystem ever be won? 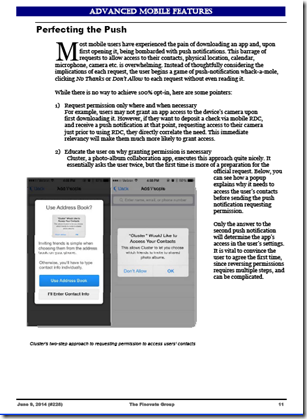 How does the rise of the mobile channel make biometric security almost inevitable? Will promising security startups continue to be the target of larger tech acquirers in 2014 as they were in 2013? 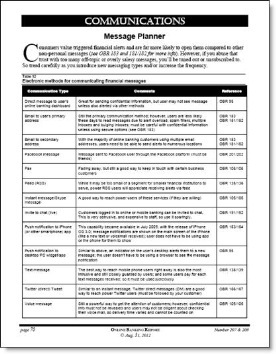 These are a handful of the questions we provide answers to in our latest report on mobile banking security from OBR. That may be true, but like Napster when it created the “internet for music” there will be substantial push-back from existing players. And this time, legacy providers will have the full support of the government to keep the newcomers in check. But as the music industry changed post-Napster, we expect the rise of bitcoin, and digital financial transfers in general (especially mobile), to have lasting impact on the financial services industry. The rapid rise of mobile payments at PayPal, the original alt-payments disrupter, illustrates the speed of change in the space. This report looks at the latest developments and recommends potential courses of action for financial institutions of all sizes. 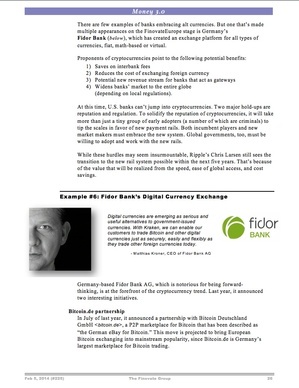 Apple, Bitcoin, & mobile apps are changing the game. What’s a bank to do? 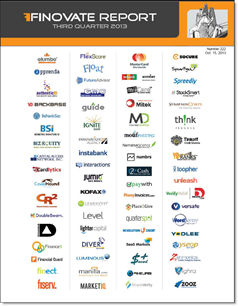 We’ve just published our latest report, Finovate Quarterly: Q3 2013. It focuses on the latest fintech developments, especially those at FinovateFall, with full profiles of our eight Best of Show winners. The report highlights the important funding, milestones, metrics and product launches during the past three months. 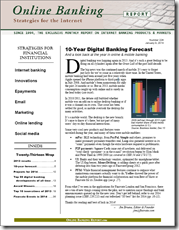 In addition, there is a section on new banking business models for the next 10 years and beyond. 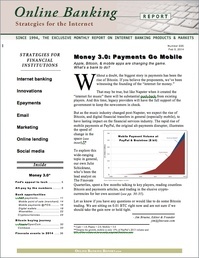 The Finovate Quarterly is complimentary for our Online Banking Report subscribers and is automatically delivered to them via mail. Anyone else can purchase here. The printed version will be mailed to subscribers this week. Has anyone started their 2014 plan? We didn’t think so. But with only 141,000 minutes until the new year (see inset), it’s high time to start working on it. And we are here to help. 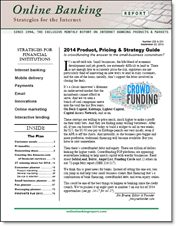 Our annual reference, OBR’s 2014 Product, Pricing, & Strategy Guide is now available. 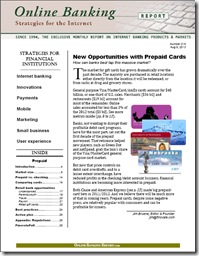 It’s a thorough resource for financial institution product/marketing managers prioritizing next year’s remote-banking efforts. The latest version was posted online last a few days ago.